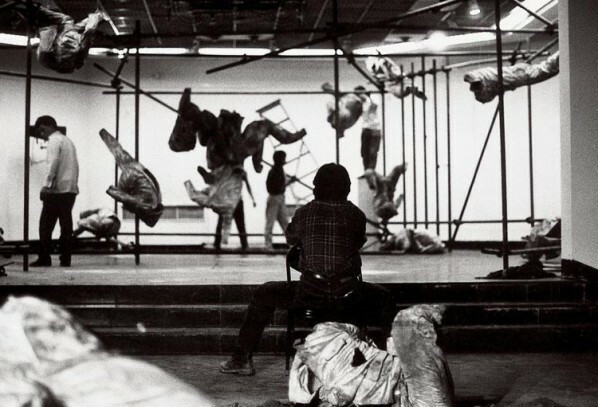 Zhan Wang viewed from behind while he was preparing for his solo exhibition in April, 1994. Part II You Too Lose Sometimes! In the Chinese translation of Romain Rolland’s Life of Michael Ange, translator Fu Lei wrote at the end of the Life of Michael Ange “I don’t expect everybody could survive on the summit. But they should prostrate there once a year. They could change breath in their lungs there, and the blood in their veins. There they show feeling closer to eternity. After that, when they return to a plain of life, their heart shall be filled with courage to fight.”(5) Rolland considered that heroes are capable of living on summits. Rollan of the 19th and 20th century was always a writer who was passionate about heroes, he depicted heroes and successfully represented heroes through text and the broadcasting of heroes. In fact Zhan was a ‘tricky’ boy when he was a child who liked playing harmless pranks such as pouring hot water on plant sprouts of his neighbors and teasing classmates in class. He also liked swimming naked, especially when girls passed. Such ‘playfulness’ is based on the fact that he always considered himself cleverer than other people. In the training class, only one classmate could ‘converse’ with him. Identification of his EQ established the ‘aerial view’ gesture of Zhan. Mocking and ironic, his usual attitude produces a sneer on Zhan’s face. Looking through and stripping the false skin then they stick to set the uncontrolled normality and exploit an embarrassing situation this might be the most favorite of his behavior during this period. Such state continued through Zhan’s freshman year. 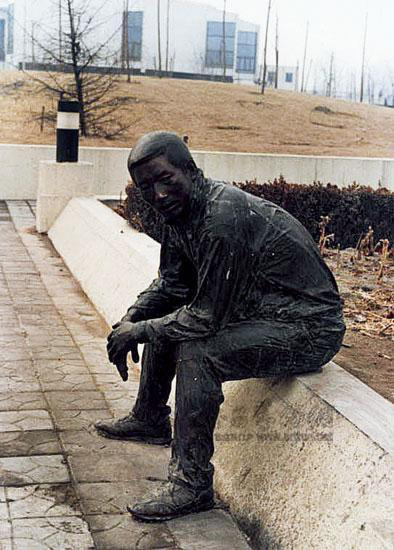 September 1984, Zhan had a liver problem in Beijing after he returned from a sculpture project. He couldn’t continue his sophomore year and took a 6 months break. During this time, Zhan experienced the pain of illness in one respect, while on the other he had a transition in his mind. The proud boy felt left behind by his classmates —— “Like falling in a ditch, with no strength” The illness changed Zhan from a satirist and critic into a ‘level headed’ person. He realized that “You too lose sometimes!” In his own words, he “saw the world as round, not only one aspect at a time.” Knowing what he was good at and what not so, therefore he established another objective view of himself and the world he lives in. After Shostakovich’s’ death, the Soviet Union announced him as “most loyal son of the nation” while western countries deemed him “greatest composer of 20th century, loyal believer of Soviet regime” yet he himself said “Waiting for execution by shooting is a subject that tortured me for my whole life.” “Stalin liked to put a person face to face with death and let the man dance with his own melody.” During his illness, Zhan’s friend introduced him to Shostakovich’s biography to solve his contradicted mind at that time. Such contradiction, in Zhan’s view is a common contradiction of his time —— the mode of existence of ‘double-faced person’. Obviously, at this time Zhan’s state is further away from the critical and ironic Zhan. 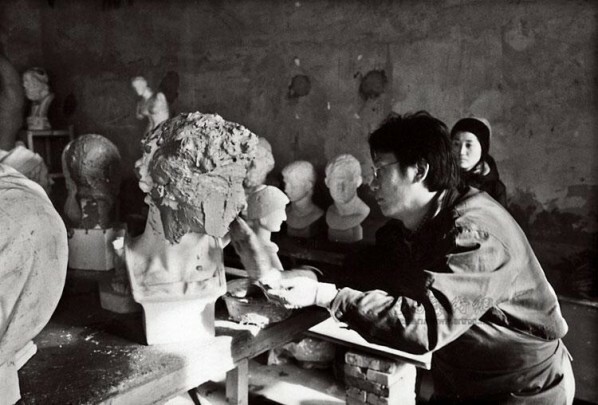 When at training school, Zhan had been introduced to works of modern artists such as Rodin, Picasso, Emile Antoine Bourdelle and Henry Moore etc. and the works of those artists had more or less influenced his early works. Those influences are mainly reflected in his imitation of a work style. Zhan was vexed on this. He said in retrospect that “When I express my life, the molding language I used is mostly others, mostly learned from albums, such as Picasso’s male (shepherd), Marinian female body, colourful consecrates in Chinese ancient temples. When you don’t have your own vocabulary (or you haven’t been taught to find your own vocabulary), you have to borrow others’ when you need to express.” In fact, in Zhan’s graduate creation “Streets” in 1988, there is an obvious trace of Marino Marini. At the time he had not found his own language. What marks the maturity of an artist is the setting up his own art language. I think Zhan at the time must have realized this problem, otherwise he couldn’t be so vexed and depressed. Predominated by this cognition, Zhan made a desperate decision: reduce the expression (work style as we usually say) to ‘zero’. Under such circumstances, any learned style, no matter Chinese or western, ancient or modern, became his potential enemy. Actually, when artists of ’85 New Wave were still indulging in ‘modernism art’, Zhan Wang, who entered in the Central Art Academy in 1984 was introduced to ‘post-modernism’ through reading. The earliest book which inspired him was Western Post-modernism Architecture. In the Chinese art field, the word ‘post-modernism’ was first brought into architecture, at the time ‘post-modern art’ are rarely mentioned, which makes when Zhan felt ‘modernism’ and ‘’85 New Wave’ as outdated. 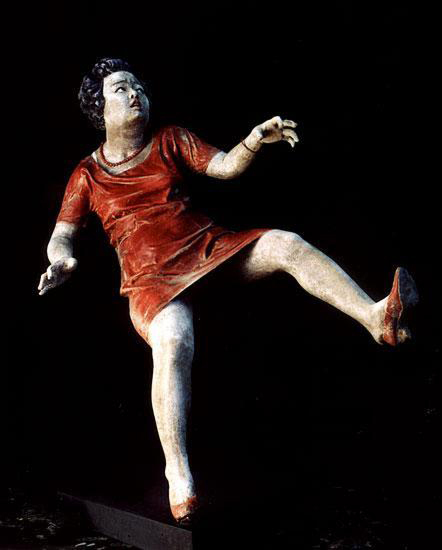 Doubtlessly, ‘Superrealism’ (especially George Segal’s Pop sculptures) of post-modernism art remarkably influenced Zhan’s later creations (1988 – 1993). In 1990, Zhan adopted the superrealism concept into his work “Sidewalk”. Among the sculptures, Zhan initially made a complete body model out of clay, then he put clothes on the model and fixed them and molded it to hard material and coloured it. He used this creation to empty, zeroing himself and forgeting all the language of sculpture as accumulated by predecessors. Starting all over again from the unknown. On another level, from the life around him, he learnt to use his own eyes (rather than ‘colored glasses’ made of others’ styles) to view the world. Zhan created colored a sculpture series “The Moment”, among which there is “The Mao Suit”, “Sitting Girl”, “Woman Lost-Weight” etc. The latter two made Zhan an outstanding artist in sculpture field. ‘My own eyes’ as Zhan said remind me of Gerhard Richter’s creative concepts. In Richter’s view, an individual artist’s understanding to the real world and their reappearance or expression of the real world are based on prejudiced ‘ideology’, or reformed by ‘style’ from education and lost objectivity and partially covered by the abundant information of reality itself. Richter found a way to get rid of ‘ideology’ and any influences from the past, which is to put ‘photography’ in between the real world and the subject, then regard it as the real ‘objective’. His purpose of painting was not as a cross objective of ‘photography’, and connect it with the real world in any way; but satisfied with confronting the objective of ‘photography’ and aimed at discovering abundant information of ‘photography’. Therefore we are not surprised that Richter said that he doesn’t express the photo, his painting is infinitely approaching photo. Based on the same reason, he chose the ‘famous’ flat paint technique. In fact, Richter wanted to learn to observe the world like a camera lense and get rid of the shadow of ideology influenced by the skills he learned. If Zhan was ‘expressing’ in the style of modernist masters, he is ‘representing’ a superrealism style. Having experienced such transition from ‘aerial viewer’ to ‘eye level viewer’, Zhan’s angle of view is different from the norm.. This transition coincides with the transition of the 80s and 90s and the 20th century. Described by critic Yi Ying, it is “from ode to heroes to commonplace world”. 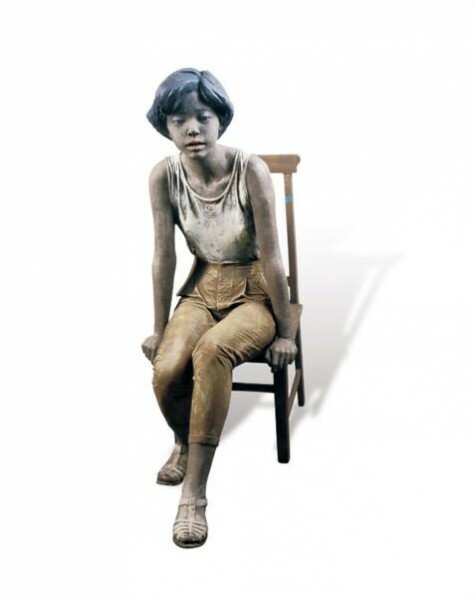 In 1991, the “New Generation Art Exhibition” was held in the Chinese History Museum of Beijing, Zhan Wang’s “Sitting Girl” was the only selected sculpture. Artists of this exhibition didn’t care much about ‘ideal’, ‘sanity’ and the grand narrative they concentrated on the personal experiences. It enables them to express people around them ‘in close distance’. The works are extremely ‘objective’ on the surface. However if we look closely, we can find works of the ‘New Generation’ artist Liu Xiaodong and Zhan Wang that have things in common: quiet and objective. Two reprehensive works of Zhan at the time was “Sitting Girl” and “Woman Lost-weight”. The former chose the embarrassing moment of a girl standing up while she was experiencing her menarche and the latter presents the moment when a plump woman fell. Capturing the moment of the two who lost weight (the former psychologically and the latter physically) demonstrates Zhan’s typical ‘tricky’ attitude on the one side along with his usual point of view; on the other side the freeze frame of an abnormal moment is actually ‘stick’ to daily life — people experience regular reality in irregularity. Such regularity also echoes his art language ‘superrealism’. Moreover, using such extremely striving creations, Zhan Wang wanted to sink into a still state (using only his hands rather than his brain) through a detailed description to the object. It’s his ‘zeroing’ state. In 1991, Zhan Wang participated in the “Traces of Existence: Internal Observing of Contemporary Art” Exhibition curated by Feng Boyi and Cai Qing at Yaojiayuan, Beijing. Zhan exhibited his new performance work that involved participation of the audience “New Art Quick Training Workshop”. It’s written in “Operating Rules and Precautions”: “You don’t have to keep confident of whether there’s original copy in the clay sculpture sedulously, but if not being asked, you could pretend to be careless and not talk. It’s very important to learn about the labor, for example mix the clay thinly; it’s better to wipe the mud on the original copy by yourself, then your traces would be kept and prove it’s your work. Don’t forget to take photos.” — The irony for ‘original copy,’ is the doubt it produces on the value of ‘traces’ and ridicule of the empirical. Here Zhan offers a cruel irony to academic education and idols in art history. Speaking of continuity, after 10 years, Zhan had totally ruptured the style he imitated.